Life and Times of Alex Esguerra: Saving America's Middle Class, Bringing Jobs Back to America? Saving America's Middle Class, Bringing Jobs Back to America? I smiled seeing page 261 on the fight ahead when she talked about Gina getting fired . Walmart's recent changes on hiring more part time workers and saving money by not paying benefits with part time workers. San Francisco, CA my second home after Portland, Oregon is such a good city example on this topic. San Fran as people call it is one of the most expensive cities in America to live at. It is the counterpart of New York at the West. Recently, housing cost has even surpassed New York's prices on buying a house. A typical Single detached two bedroom house back in the Pacific Northwest if your really good in hunting would have cost $420,000 to $610,000. In San Francisco, you'll be able to afford a car parking lot for this amount. A typical studio condo in the city of San Francisco, your lucky if you buy it for $900,000. Hence, a lot of the millennial population are working for the Silicon Valley Tech companies which some of them have offices and presence in the heart of the city. Come the baby boomers and in between it and the millennium generations either working in retail, hospitality and service industries. The reality is that this part of the city population are considered low income due to the mentioned high cost of living, high rents, expensive food, etc., The Housing and Urban Development a few days ago labelled a family of 4 earning $100,000 in San Francisco is now on the low income bracket. The other reality is that this so called part time jobs on retail, hospitality, restaurants, services are mostly minimum wage jobs. Thank God in 2014 that the City of San Francisco enabled several laws protecting the rights of people that live and work in San Francisco mostly affecting this said population. The city enabled a Retail Workers Bill of Rights, an accrued paid sick time law after 30 hours of work in a calendar year after 2007 and of course worked to increase the minimum wage compared for the State minimum wage. The State of California over the last few years has been working on misclassification cases of workers from 1099 Independent Contractors to W2 employees which is a common exploitation especially in the SF Bay Area. Overtime and meal breaks are a major chunk of the abuse. 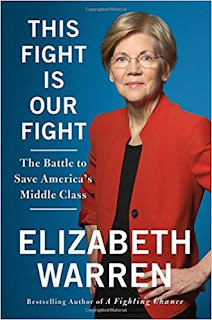 So as I decipher this book and looking at both the Democrats and Republicans, what initiatives do we really need on federal and legislative levels of government, what measures do we look into connecting the present living conditions and the initiatives already undertaken on the city level? The income divide is so great that we indeed have to work on having an affordable living situation to the grassroots minimum wage earner. So the challenge indeed with the incumbent Commander in Chief's "Making America Great Again" is that is it the glamour part of making it great or will it be going to the city levels of government and reaching out directly with minimum wage earners on what resources they need to live and work in America.